Just ahead of the weekend, AMD wrote to HEXUS to reveal the release date for its 2nd gen Ryzen Threadripper 2970WX and 2920X processors and to provide some technical background to the advances delivered. In brief, these new 24C/48T and 12C/24T processors will be available worldwide from 29th October, and performance will be enhanced in games, thanks to tweaks to Windows 10 v1809, and due to the introduction of the new AMD Dynamic Local Mode. AMD says that this new pair of Threadripper processors will build upon the excitement momentum raised by the launch of the 2nd Gen Ryzen Threadripper 2990WX and 2950X (HEXUS review links) launched in August. 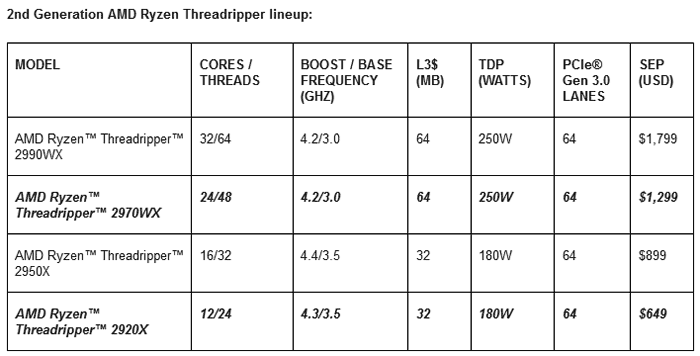 You can see all four of these 2nd gen processors compared in the table below. The new 24C/48T Ryzen Threadripper 2970WX is claimed by AMD to be a great choice for creators and innovators tasked with intense workloads, while the AMD Ryzen Threadripper 2920X “delivers astounding processing power for enthusiasts and gamers,” with 12 cores and 24 threads. Also this month, AMD will be introducing new AMD Dynamic Local Mode software for the Ryzen Threadripper WX Series processors. This works by optimising application performance by ensuring the most demanding threads always get preferential time on cores with local memory. "The Ryzen Threadripper 2970WX and 2990WX achieve breathtaking performance with 24 or 32 cores spread across four processor dies: two with direct access to local memory, and two with access to memory via the Infinity Fabric. There are instances where the entire application or specific workloads can achieve the best performance when they’re executed on the two CPU dies with local/direct memory access. This is where the new Dynamic Local Mode will come in with Threadripper 2970WX and 2990WX CPUs to automatically migrate the system’s most demanding application threads onto the cores with local memory access. In other words: the apps that prefer local DRAM access will automatically receive it, and apps that scale to many cores will be free to do so." For a deeper dive into the Dynamic Local Mode technology it is well worth a look at the recent blog post by AMD’s Robert Hallock. Additionally Hallock provides some compelling Dynamic Local Mode On/Off performance comparisons in modern PC games and applications. From 29th October, Dynamic Local Mode will be a new package included with the latest version of AMD Ryzen Master. The Far Cry 5 Update 9, released on 9th August, addressed an application bug affecting many logical processor (high thread count) products, including Ryzen Threadripper 2990WX, to improve the game experience. The October Windows 10 update (version 1809) brings improved stability with products leveraging 64 or more logical processors (high thread count processors), including Ryzen Threadripper 2990WX.